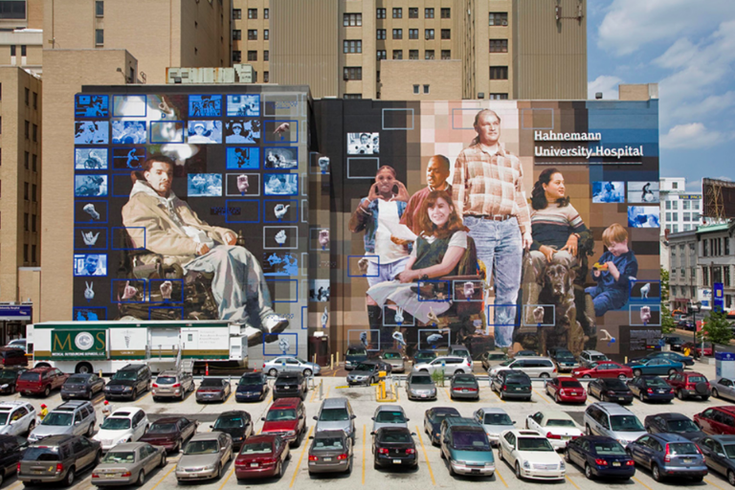 "Independence Starts Here," created by artist Donald Gensler, was installed on the side of Hahnemann Hospital in 2008 through a partnership with the Mayor's Office on People with Disabilities, ArtReach and Kardon Institute, among others. On a wet, windy Monday that has flipped umbrellas inside out and generally annoyed everyone in the Delaware Valley, a piece of a celebrated mural on the facade of Hahnemann University Hospital became a casualty of the weather, as did two cars parked directly below the fallen artwork. The nor'easter sweeping through the region claimed a big chunk of Donald Gensler's 12,500-square-foot "Independence Starts Here" mural, also known at the Disabilities Awareness Mural, which went up between 2006 and 2008. "Within the design, people with disabilities stand as monuments symbolizing different actors within a diverse and extraordinary community," Gensler wrote of the mural on his website. "These people are all from Philadelphia and of different races, genders and backgrounds. Each person has a disability and is an engaged contributor to the various communities he/she represents." At around 10:30 a.m., a piece of the "parachute cloth" mural broke loose from the building while several other pieces dangled perilously from the wall. Video of the scene at 230 N. Broad St. was captured by NBC10. According to the Mural Arts Program, this is the first time a piece of one of its murals has fallen off a building. About half of the city-run organization's more than 4,000 murals are made of parachute cloth and assembled in panels on the walls where they reside. The Mural Arts Program is regarded as the pioneer of the "parachute cloth" method of mural construction. There were no injuries reported in the incident, and it was not clear what level of damage was inflicted on the cars seen blanketed by the fallen cloth. Representatives from the Mural Arts Program said they will work with Hahnemann Hospital to address any immediate needs and collaborate on plans to repair the mural at a future date.